The latest smartphone announced by the Japanese electronics giant is named as Sony Xperia C which is expected to release in Q3 of 2013. Looking at the specifications of the smartphone it is expected to target the lower & middle price market. Sony Xperia C is a 3G Dual Sim smartphone which sports a 5 Inch TFT Capacitive Touch screen with multi touch & most probably will feature Timescape UI. This smartphone has a qHD display with resolution of 540 x 960 Pixels, ~220 ppi pixels density, 16 M Colours. 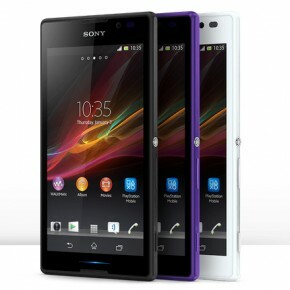 Sony Xperia C dimensionally measures 141.5 x 74.15 x 8.88 mm (5.57 x 2.92 x 0.35 in), it weighs 153 gms (5.40 oz) & there will be three colour options to select from Black, White & Purple. Technically this smartphone is loaded with a Quadcore 1.2 GHz ARM Cortex A7 Processor, MediaTek MT6589 Chipset, PowerVR Series 5XT GPU, 1 GB RAM. Sony Xperia C will come out of the box with Android OS v4.2.2 (Jelly Bean). This budgeted smartphone is holding great specifications under its skin to make it run latest games & perform multi task efficiently. The internal memory of Sony Xperia C is 4 GB which is a bit disappointing but it makes up for the lack by packing in a SD card slot that supports upto 32 GB microSD (a must buy). The data connectivity aspect of this smartphone is also moderately loaded as it holds Wifi, Wifi HotSpot, Bluetooth v4.0, microUSB 2.0, GPS with support for A-GPS. To collect your memories on the go it holds on its rear a 8 MP Primary lens with Exmor R sensor, LED flash light, auto focus, geo tagging. This snapper is capable of clicking images of resolution 3264 x 2448 Pixels & record HD videos of 1080 P @ 30 fps. The Exmor R sensor allows the camera of the smartphone to capture high definition movies and stills in low lit area. The Secondary camera of the smartphone is 0.3 MP which can be used for video chatting. Sony Xperia C packs a Li-ion Battery with a juice of 2390 mAh.